FLORHAM PARK, N.J. (AP) — Sam Darnold wants the same thing New York Jets fans are hungry for: victories, and starting now. The rookie quarterback wrote an open letter that was posted on the team’s official website Thursday in which he talks about his transition to the NFL, how the first four games of his career have gone and his visions for the future. The Jets are 1-3 and on a three-game skid after a season-opening victory at Detroit. They begin a three-game homestand Sunday against Denver, with games against Indianapolis and Minnesota to follow. “We’re going to make adjustments when they need to be made and I’m very confident in our team,” Darnold closed the 475-word letter. “We’re headed in the right direction. Now, it’s time to execute and win some games. I can’t wait to play in front of the home crowd for three straight games. Jets fans are amazing. The letter is part of a regular feature on the Jets’ site called, “In My Own Words,” in which a player writes his thoughts to fans. This is the first to include Darnold, who was the No. 3 overall pick out of USC in April. “Deep down, winning is everything to me,” Darnold writes. “I’m not going to show too much emotion, but that’s the way my competitive nature is. It’s that fiery passion I have for the game or my competitiveness in general. Whether it’s a board game or a football game on a Sunday, it’s the same for me. 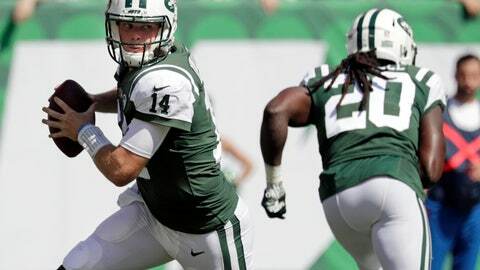 Darnold has four touchdown passes and five interceptions, and his 57.5 percent completion rate and 72.6 quarterback rating both rank near the bottom of the league. Offensive coordinator Jeremy Bates said Thursday that he has seen good progress in the young quarterback’s decision-making process. Bates added that the game is slowing for Darnold, who called the interception returned for a touchdown on his first throw in the NFL “unfortunately” his “signature moment” so far. In his letter, Darnold says he understands the process takes time, and he thanked 39-year-old backup quarterback Josh McCown — who he described as his “coach/brother/uncle and everything in between” — for his guidance and tough-love approach at times. Darnold mentioned how he appreciates how Joe Namath recognized his talent when the two met, describes how he grew up watching USC football and then playing for the Trojans, and how being an NFL quarterback in New York is “a dream come true” for him.